Employment growth beat expectations in October, with nonfarm payrolls rising by 151,000 positions, the first monthly gain reported since May. Private-sector employment, which expanded during each of the last 10 months, climbed by 159,000 positions in October, while government cutbacks shaved 8,000 jobs from the monthly total.The latest employment report provides cause for optimism that the still-cautious private sector has finally begun to build momentum toward recovery. The latest job numbers represent a clear step in the right direction, bringing the average private-sector monthly gain for the 90-day period ending in October to 136,000 jobs, up from an average of 76,000 positions during the preceding three-month period. At the same time, however, recovery remains weak and job creation still fell short of levels necessary to pull down the unemployment rate, with held steady in October at 9.6 percent. The resumption of stronger growth will require more concrete signs of recovery and an upswing in business confidence capable of spurring further hiring and capital investment. The latest move by the Fed, to initiate another round of quantitative easing, should help by weakening the dollar and keeping interest rates low for the next several months. These trends will likely promote greater demand from overseas and encourage business spending, driving stronger overall economic growth and job creation. 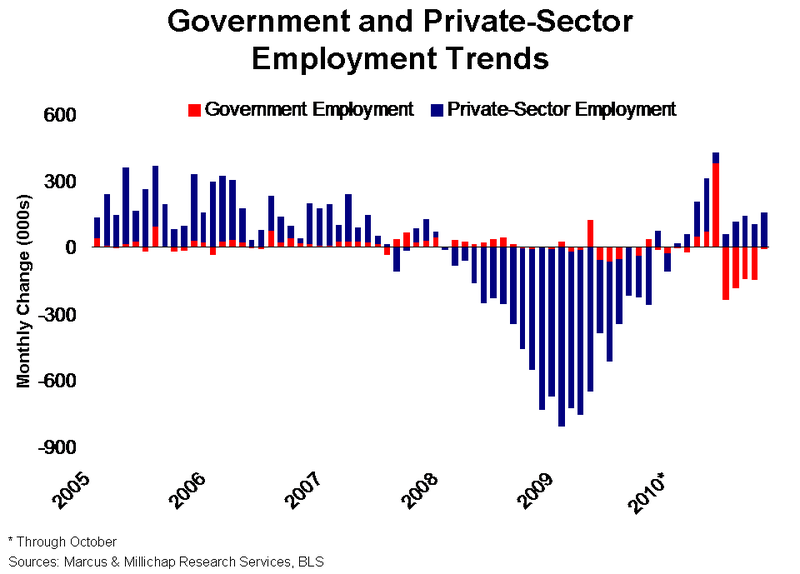 Last month’s acceleration in private-sector job growth can be attributed primarily to service industries, led by the education and health services and professional and business services sectors, which added 53,000 jobs and 46,000 jobs, respectively. Notable growth of 37,000 jobs also was recorded by the trade, transportation and utilities sector, which benefited from a pick-up in hiring in the retail trade segment. The leisure and hospitality sector, however, lost 7,000 jobs after reporting four consecutive monthly gains. Manufacturing payrolls lost ground for the third straight month, confirming suspicions the sector’s run early in the recovery has lost steam. Despite only minimal support from private-sector job creation through most of this year, apartment absorption has surged, reaching more than 160,000 units during the first three quarters of 2010 and driving down vacancy 90 basis points to 7.1 percent. Through the next phase of the cycle and over the longer term, job creation will resume its traditional role as the primary determinant of apartment demand. Early recovery in the apartment sector, which began in the second quarter of 2010, likely was tied to housing and demographics, as well as the release of pent-up renter demand from individuals who doubled up or moved in with family during the recession. These trends should maintain momentum into 2011, further improving vacancy rates. Office-using employment sectors bottomed late last year and have since expanded by 287,000 positions. While the gain is significant, it represents only 11.4 percent of the total office-using jobs lost from the most recent peak to the trough in October 2009. The resumption of growth in office-using industries has yet to gain enough momentum to drive down office vacancy rates at the macro level, but it has proved sufficient to significantly slow the pace of increase. In the third quarter, the office vacancy rate ticked up just 20 basis points to 17.6 percent, the smallest quarterly increase since late 2007. Early signs of recovery have been noted at the market level, though, with metros such as Tucson, Sacramento, the District of Columbia and Jacksonville all posting improvement during the past two quarters. This entry was written by marcusmillichap, posted on November 9, 2010 at 12:57 am, filed under Research and tagged Employment. Bookmark the permalink. Follow any comments here with the RSS feed for this post. Trackbacks are closed, but you can post a comment. Looking to the Graph it seems that the government employees has to lose their job constantly during current and next coming years. Hope the fiscal deficit might be the reason for this. You do realize that the BLS re-calculated the Seasonal Adjustment Formula, right? Turns out that out of the supposedly 151k jobs, only 50k were actually added. Oh, gee, didn’t know that one? Seems someone at M&M didn’t do their research. Typical though of these big corporate blobs. Especially in the RE industry, full of BS and rhetoric. I like your post.only because of you explain the information of employees expectations growth in October.Thanks for taking time to discus on this topic.